Storing and querying XML from a database in an efficient way with JPA, can be somewhat of a headache. This post describes how you can can use Oracle’s XMLType to achieve this. Assuming you really really have to store the raw XML, there are a few options. Probably the easiest and most straightforward way, is to store the document as a String property annotated with @Lob. With this option you would just marshal the XML document to a String and save this as a CLOB type database column, potentially with other columns/properties related to this document and saving these along with the document in a single table/entity. Retrieving the document is equally as simple, given the String property containing the XML document, simply unmarshal this property to the correct XML document. Let’s demonstrate the above with some code describing our XML document as JAXB classes and then how we would marshal and unmarshal to/from the XML format in a JPA entity. We’ll use Spring Boot to illustrate this. the sequence on our identity property is actually more for Oracle, which we’ll introduce later. To place the Order we have a RESTful resource that accepts the order XML as a POST body. Spring Boot’s auto configured Jaxb2RootElementHttpMessageConverter will automatically convert the body to our Order JAXB structure. Below is our controller and app, Spring Data JPA repository interface left out for brevity. $ curl -X POST --header "Content-Type: application/xml" --header "Accept: */*" -d "
Unmarshalling our XML document from the orderXml property’s value would be a similar affair. Quite simple then, however, the problem with this option is that you cannot query the XML document easily. For example, you cannot query all records from the aforementioned table where some tag in the document equals X. Instead, as part of your app design, you would have identify which tags in your document might be queried and then extract those into their own columns (like the customer property above), allowing you to include them in your queries. Alternatively, in a worst case scenario, you would have to do a select *, unmarshal the document from each record and then filter with xpath etc. Pretty nasty stuff. Basically, the Oracle XML DB related technologies bring the benefits of the relational world to the XML world. Allowing you to query the XML document as you would in the relational world with similar performance and features. So, need to store your XML data in its native form? Using Oracle as your database engine? 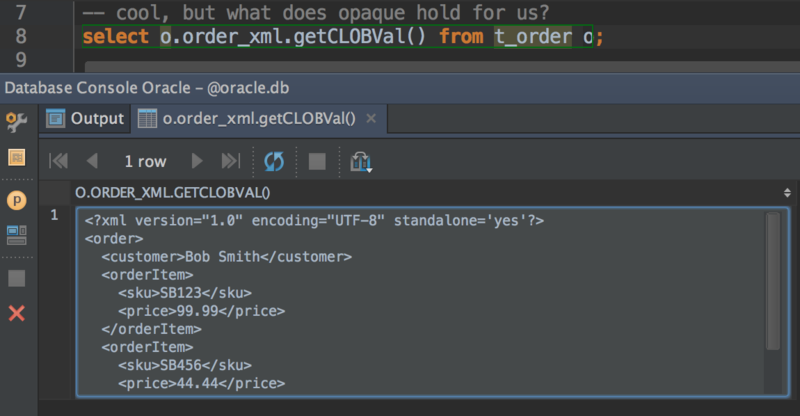 XMLType with Oracle XML DB it is! Life’s too short. That’s not a prediction. Wouldn’t it be great if we could just set our JAXB instance directly on our entity and have all the gory details of persisting it to an Oracle XMLType column done for us? Well, that’s exactly what we’re going to do. Hibernate, the default ORM used by Spring Data JPA apparently does not know how to handle or map our Order class to a database column. Fair enough. So we’ll just have to tell Hibernate how we’d like this type handled. We can do this by specifying our own org.hibernate.usertype.UserType. // to prevent "org.h2.jdbc.JdbcSQLException: Parameter "#?" is not set; SQL statement"
now that our user type is defined, we need to annotate our entity’s order property to inform Hibernate how to map our Order. that should do it! Now, if only we had an instance of Oracle running locally to test… Luckily for us, there is a Docker container with just such a thing. Arg! Seems Hibernate does not know what column type to use for JDBC type code 2007. Really? Anyone could tell you that code 2007 maps to a column type of XMLTYPE! Gosh, well, suppose the right thing to do would be to give Hibernate a hint by extending the org.hibernate.dialect.Oracle10gDialect and defining the mapping ourselves. Success! Let’s check out what it looks like in the database, just to make sure that it’s actually persisted as an XMLTYPE column. definitely has, so what did we persist? yup, we can do that as well. Try changing the sku SB123 to say, SB000 and you’ll notice that no results are found. You know, just to check if it’s really working. I’d ask you to sit down, but, you’re not going to anyway. And don’t worry about the vase. With a little work, we’ve successfully persisted our JAXB instance to an Oracle XMLType column while still keeping with a simple JPA programming model. Only one thing remains, how do we allow our app to be tested without having to fire up an Oracle instance every time? What we really want, is to use Oracle when running in a production environment but use H2 when running our tests. now that registering our custom type can been swapped out, all we have to do now is create a testable version of our OracleXmlDialect that does not depend on any Oracle specific implementation. I.e. we’ll marshal/unmarshal our JAXB instance from/to String which will be persisted in a VARCHAR column. In this post, we saw how we can persist a JAXB instance to an Oracle database using the native XMLType support, without breaking the JPA programming model and still with the ability to test against an in memory database like H2.